This is it, the moment we have been waiting for – the 2013 Academy of Art University Graduation Fashion Show and Awards Ceremony. And for the first time ever, it is being held at the Palace of Fine Arts, a San Francisco landmark. To say that they could not have chosen a better location would have been an understatement. Holding the graduation fashion and awards ceremony there make it THE EVENT of the season. San Francisco is a bustling city with a very busy social calendar. AAU getting the Palace of Fine Arts as a venue was a coup. But before I give you the collections (yes, Virginia, the highlight of this diary is the Graduation collections), let’s check out the front row first. You have already met Christina Neault, Executive Producer of IMG and Jayne Seward of Los Angeles-based Apparel News. Sitting beside them were Victoria DiGiacinto, Chief Merchant of St. John and Greg Myler, Chief Designer of St. John. Towards the right are Daniel Reynolds of Diane von Furstenberg and Neil Gilks of CFDA. If you’re wondering where I’m sitting, I was sitting towards the left; but since I cannot take a photo of myself without looking silly, I took a photo of my seat. Further up, and nearer the podium are Lubov Azria and Max Azria who were just called front and center to accept their Honorary Doctorate Degrees in Fashion. A very solemn ceremony, Dr. Elisa Stephens, President of the Academy of Art University presented the Azrias their diplomas. 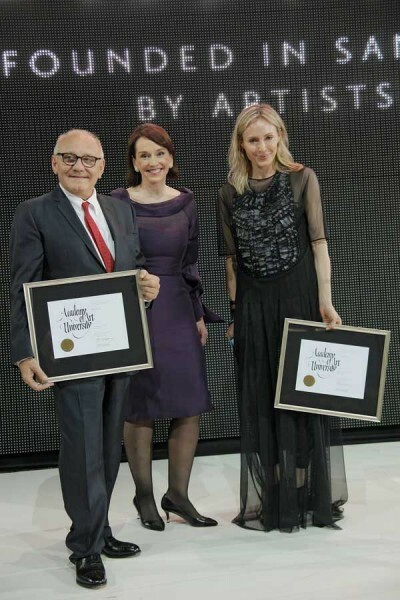 Max Azria in his inimitable old-world gentleman style accepted the award with his understated aplomb. Thanking Dr. Stephens for bestowing him the honor, Dr. Max Azria also commented how impressed he was with the AAU, his opinion being based on what he observed during the tour of the School of Fashion. While Max Azria was more on the serious side, his wife and co-creator at BCBGMaxAzria, Lubov Azria was more lighthearted in her acceptance speech as she addressed her husband as “Dr. Azria”, adding that she just wanted to actually say the words. I don’t remember the exact words that Lubov Azria said. Though I recorded it, there was too much background noise in the tape. What I remember though is the graceful way Lubov accepted the honor –pride for her accomplishment yet humble at the same time.